Last Malaysians standing at their home Super 750 event, Tan Kian Meng and Lai Pei Jing failed to pull off a 3rd straight comeback as mixed doubles will get a repeat final. Tan Kian Meng and Lai Pei Jing (pictured right) started their week off brilliantly. The Malaysians were keen to get back on a winning track after a dismal 2018 saw them slip from the world’s top ten all the way down to #38 in the world. 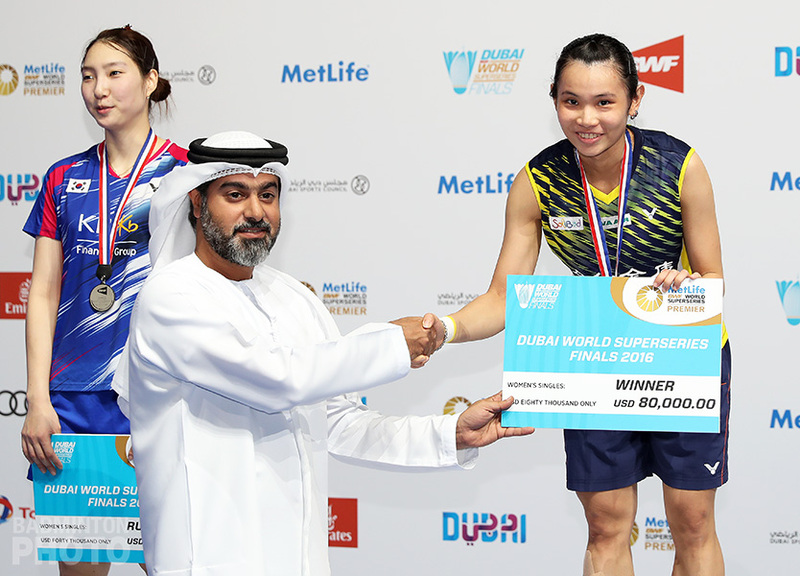 They opened their campaign at their home Malaysia Open Super 750 with a convincing win over Malaysia Masters winners and world #3 Watanabe/Higashino. The unseeded home favourites had given the crowd something to cheer about in the next two rounds as well. In both matches, they dropped their first game and fought back from a late deficit to force a deciding game which they won in both instances. 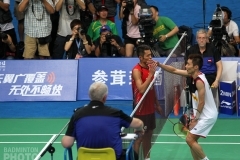 In Saturday’s semi-final, Tan and Lai inadvertently found themselves forced to play the same game of catch-up. 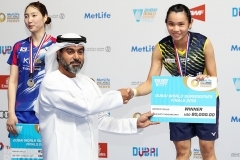 This time, it was 2018 runners-up Wang Yilyu and Huang Dongping (pictured top) who won the first game and had them on the ropes at 18-14 in the second. The Malaysians were already 0-5 against the world #2 but they still mounted a very promising comeback, grabbing the attack and keeping up the pressure until they had cut the Chinese pair’s lead to just one point. Huang Dongping rose to the occasion, however, and pull off some incredible angles as she and Wang held on to finish the match in two. The mixed doubles final will hence be a repeat of last year’s final, or indeed of last year’s World Championship final or three other finals since then. Such is the way with such consistent pairs occupying the top two spots in the world ranking. Top seeds Zheng Siwei and Huang Yaqiong (pictured bottom) dominated their semi-final against Thailand’s Puavaranukroh/Taerattanachai, another pair they beat 5 times last year. Mixed doubles will not be the only discipline to feature a World Championship final repeat. A day after winning their own final repeat, Fajar Alfian / Muhammad Rian Ardianto, who reversed their result against Asian Games gold medallists, had to bow in the semi-final to Japan’s Takeshi Kamura / Keigo Sonoda (pictured). The Japanese pair played phenomenal defense and together with their precision attacking play, they shut down the Indonesians in less than 40 minutes. 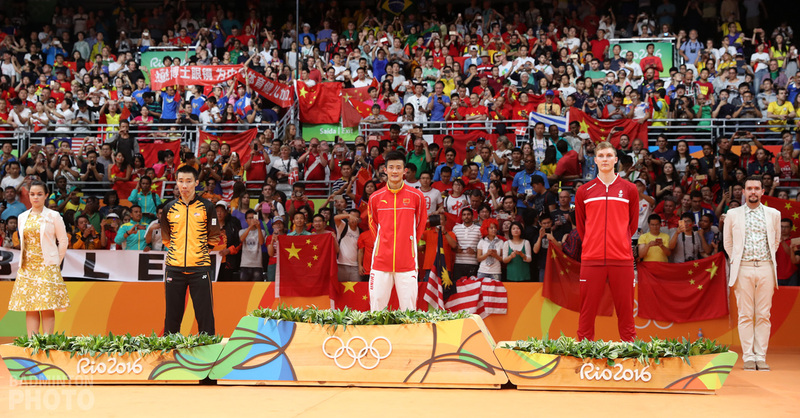 The prospect of an all-Japanese final was on the table on Saturday morning but it was cleared away when Li Junhui / Liu Yuchen had a very strong finish to ensure that Sunday’s final would instead be a replay of Nanjing last summer. Japan’s Hoki/Kobayashi nearly erased the World Champions’ 6-point lead late in the deciding game but Li/Liu took 5 straight points to secure their place in the final. Men’s singles on Sunday will feature the only two overseas players in the last 12 years to have won this Malaysia Open title. 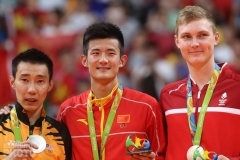 First, Olympic gold medallist Chen Long took on Asian Games gold medallist Jonatan Christie (pictured). Christie seemed to have done the whole field a favour on Thursday, when he ousted world #1 Kento Momota. 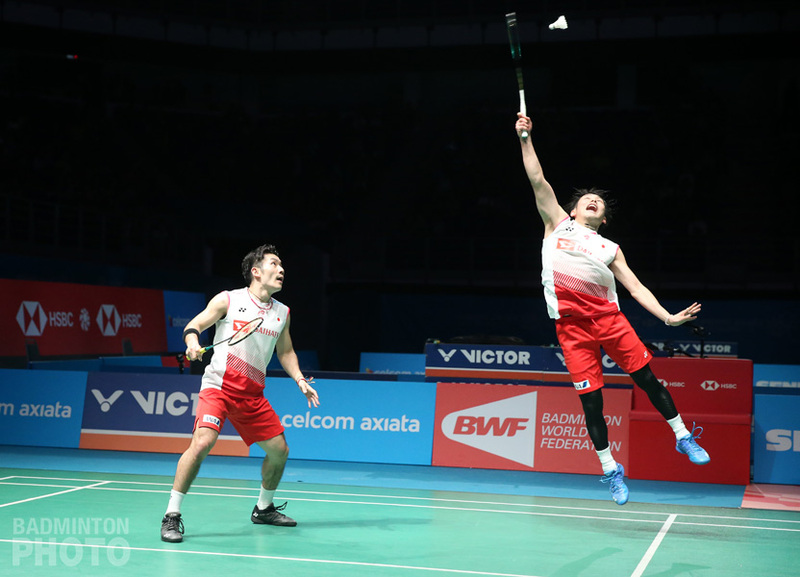 However, with his quarter-final defeat of Axelsen, the Indonesian looked as though he might just keep the advantage to himself. Indeed, Christie’s opener against 2015 winner Chen Long was very one-sided. But the Chinese veteran got his act together and took the next two games convincingly. Lin Dan performed a similarly strong finish as he took down compatriot Shi Yuqi 21-12 in the deciding game of their semi-final. 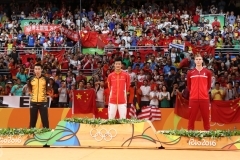 Chen and Lin have already met in finals in 7 of their 12 international encounters. The last such occasion was nearly two years ago, at the 2017 Asian Championships. Women’s doubles was actually the first all-Chinese final to be set up. Former World Champions Chen Qingchen and Jia Yifan (pictured) were coming off a victory in their last international tournament, as were their opponents Chang Ye Na and Jung Kyung Eun of Korea. The Koreans started strong but Chen and Jia scored 9 unanswered points to take the first game 21-14. 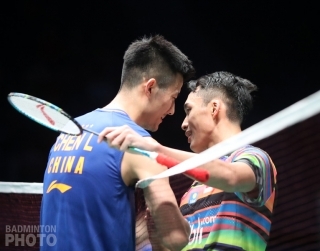 Chang and Jung, who reached the final here in only their second tournament as a pair, back in 2015, stayed closer in the second game but still couldn’t avoid giving up the attack as Chen and Jia kept the pressure on with varied angle attacks. Also looking for their second title of 2019 are German Open winners Du Yue / Li Yinhui. They won handily over Thailand’s Jongkolphan Kititharakul and Rawinda Prajongjai. The only final with neither a current nor a former World Champion is the women’s singles. 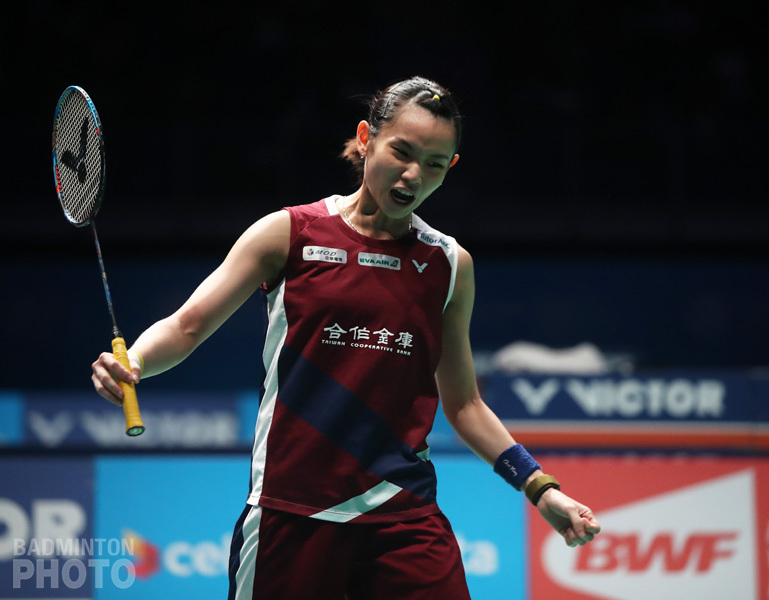 World #1 Tai Tzu Ying (pictured) again found the edge over Chen Yufei after losing her first match ever to the young Chinese star at last month’s All England. Former World Champion Nozomi Okuhara had two game points against compatriot Akane Yamaguchi in their second game but was unable to force a decider. Yamaguchi is looking for her second title of the year, after winning the German Open Super 300.